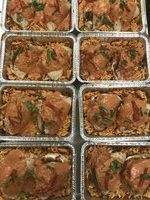 Chicken breast stuffed with mozzarella cheese, pesto (contains nuts) and fresh basil topped with a creamy tomato sauce. This dish is served over penne pasta. Lower carb alternative: baked parmesan zucchini. Please indicate your preference for the veggie side dish. Otherwise, we will assume pasta. You can also order extra servings of the veggie side dish for $2.50 per person. $13 for a single serving / $24 for two servings / $44 for four servings. 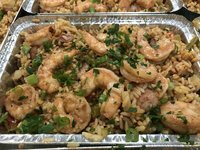 This flavorful concoction of rice mixed with sausage, ham and shrimp has a pop of fresh herbs and spices (with a bit of a kick). This is an item you would take home and reheat. $18.50 for a container with two servings. 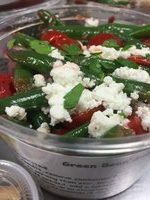 Green beans tossed with grape tomatoes, red onions and goat cheese and a red wine vinaigrette, topped with fresh basil. Good for a healthy lunch or side dish. $10 for a 16 oz container. *All prices are subject to 6.5% sales tax. **Cash, credit cards or checks accepted. Checks should be payable to Zest! Catering.